Coe, Á., Martin, M., & Stapleton, T. (2019). 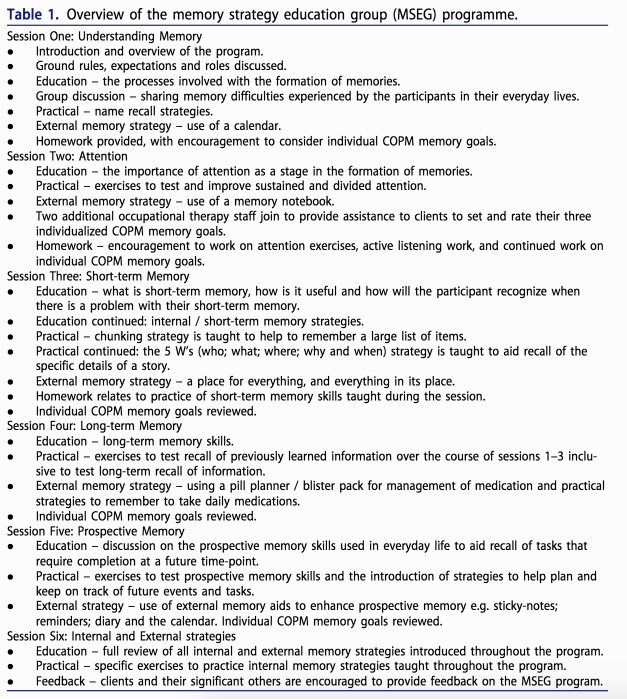 Effects of An Occupational Therapy Memory Strategy Education Group Intervention on Irish Older Adults’ Self-Management of Everyday Memory Difficulties. Occupational Therapy In Health Care, 1-27. The MSEG is a goal-focused program akin to a compensatory cognitive training approach. This program aims to assist individuals with memory impairment to retain skills and to deal with memory difficulties in their everyday life in a proactive, practical, and individualized manner. Statistically significant improvements noted on Rivermead Behavioural Memory test II for clients with subjective memory complaints, and early dementia. Clinically significant improvements on the COPM, which were maintained at 3 months in all subgroups. Meaningful improvement in QOL in all groups. The MSEG provides a practical outline for a 6 session intervention program that has the potential to help older adults improve subjective memory complaints. The intervention helps improve QOL and subjective functional performance and might also improve memory as assessed by a standard component measure (RBMT-II). Comparing the intervention with a control in a randomized study will be important to establish higher quality evidence - but the program template as it stands is useful for any OT working to improve memory issues. Newer PostHow can OT help with obesity?